Ball State is classified by the Carnegie Classification of Institutions of Higher Education as a doctoral university: higher research activity. The university is composed of eight academic colleges. As of 2017[update], total enrollment was 22,513 students, including 17,004 undergraduates and 5,509 postgraduates. The university offers about 190 undergraduate majors and 130 minor areas of study and more than 140 master's, doctoral, certificate, and specialist degrees. There are more than 400 student organizations and clubs on campus, including 34 fraternities and sororities. Ball State athletic teams compete in Division I of the NCAA and are known as the Ball State Cardinals. The university is a member of the Mid-American Conference and the Midwestern Intercollegiate Volleyball Association. The Frank A. Bracken Administration Building is the oldest on campus, completed in 1899. Ball Brothers from left to right: George, Lucius, Frank, Edmund, and William. The location of today's Ball State University had its start in 1899 as a private university called the Eastern Indiana Normal School. The entire school, including classrooms, library, and president's residence were housed in what is today's Frank A. Bracken Administration Building. The one-building school had a peak enrollment of 256 and charged $10 for a year's tuition. It operated until the spring of 1901, when it was closed by its president, F.A.Z. Kumler, due to lack of funding. A year later, in the autumn of 1902, the school reopened as Palmer University for the next three years when Francis Palmer, a retired Indiana banker, gave the school a $100,000 endowment. Between 1905 and 1917, the school dropped the Palmer name and operated as the Indiana Normal College. It had two divisions, the Normal School for educating teachers and the College of Applied Sciences. The school had an average enrollment of about 200 students. Due to diminishing enrollment and lack of funding, school president Francis Ingler closed Indiana Normal College at the end of the 1906–1907 school year. Between 1907 and 1912, the campus sat unused. In 1912, a group of local investors led by Michael Kelly reopened the school as the Indiana Normal Institute. To pay for updated materials and refurbishing the once-abandoned Administration Building, the school operated under a mortgage from the Muncie Trust Company. Although the school had its largest student body with a peak enrollment of 806, officials could not maintain mortgage payments, and the school was forced to close once again in June 1917 when the Muncie Trust Company initiated foreclosure proceedings. On July 25, 1917, the Ball brothers, local industrialists and founders of the Ball Corporation, bought the Indiana Normal Institute from foreclosure. The Ball Brothers also founded Ball Memorial Hospital and Minnetrista, and were the benefactors of Keuka College, founded by their uncle, George Harvey Ball. For $35,100, the Ball brothers bought the Administration Building and surrounding land. In early 1918, during the Indiana General Assembly's short session, state legislators accepted the gift of the school and land by the Ball Brothers. The state granted operating control of the Muncie campus and school buildings to the administrators of the Indiana State Normal School in Terre Haute. That same year, the Marion Normal Institute relocated to Muncie, adding its resources to what would officially be named the Indiana State Normal School – Eastern Division. An initial 235 students enrolled on June 17, 1918, with William W. Parsons assuming the role as first president of the university. The close relationship between the Balls and the school led to an unofficial moniker for the college, with many students, faculty, and local politicians casually referring to the school as "Ball State," a shorthand alternative to its longer, official name. During the 1922 short session of the Indiana legislature, the state renamed the school as Ball Teachers College. This was in recognition to the Ball family's continuing beneficence to the institution. During this act, the state also reorganized its relationship with Terre Haute and established a separate local board of trustees for the Muncie campus. In 1924, Ball Teachers College's trustees hired Benjamin J. Burris as the successor to President Linnaeus N. Hines. The Ball brothers continued giving to the university and partially funded the construction of the Science Hall (now called Burkhardt Building) in 1924 and an addition to Ball Gymnasium in 1925. By the 1925–1926 school year, Ball State enrollment reached 991 students: 697 women and 294 men. Based on the school's close relationship with the Ball Corporation, a long-running nickname for the school was "Fruit Jar Tech." During the regular legislative session of 1929, the General Assembly nominally separated the Terre Haute and Muncie campuses of the state teachers college system, but it placed the governing of the Ball State campus under the Indiana State Teachers College Board of Trustees based in Terre Haute. With this action, the school was renamed Ball State Teachers College. The following year, enrollment increased to 1,118, with 747 female and 371 male students. In 1935, the school added the Fine Arts Building for art, music, and dance instruction. Enrollment that year reached 1,151: 723 women and 428 men. As an expression of the many gifts from the Ball family since 1917, sculptor Daniel Chester French was commissioned by Muncie's chamber of commerce to cast a bronze fountain figure to commemorate the 20th anniversary of the Ball brothers' gift to the state. His creation, the statue Beneficence, still stands today between the Administration Building and Lucina Hall where Talley Avenue ends at University Avenue. Ball State, like the rest of nation was affected by the onset of World War II. There were a number of dramatic changes on Ball State's campus during World War II. In 1939 Ball State began its Civilian Pilot Training program which had popular enrollment. This program allowed students and local resident to learn to fly, instructed by the Muncie Aviation Company. By the fall of 1941 Ball State reached its peek enrollment to this point of 1,588 students. When the United States ended the war, Ball State like many other college campuses, saw a decline in male enrollment. At this time Ball State partnered with the United States Military and established two training programs on campus, the Army Specialized Training Program and Navy V-1 Program. Each of these programs encouraged male enrollment in the college that also trained them to gone on as pilots in the military service. Ball State students and Staff also contributed to the war effort by supporting the troops abroad. Students and staff led by Sherly DeMotte, a member of the English faculty, wrote dozens of letters to Ball State students and staff serving overseas. By 1943 a dozen students from Ball State had become war casualties. To bring awareness to their service, in 1943 the War Morale Committee headed by Dr LaFollette in collaboration with the class of 1943, dedicated the Roll of Honor in April. This memorial wall listed the names of all those who served during the war. By the War's end, forty eight students had given their lives in the service and Ball State had trained more than 1,200 pilots in their training program. Those who paid the ultimate sacrifice were honored by Ball State in 1946 in their "Gold Star Memorial Service" in which surviving family members of those students were invited and to the school and honored by students and staff. In 1961, Ball State became independent of The Indiana State University through the creation of the Ball State College Board of Trustees. The official name of the school was also changed to Ball State College. The Indiana General Assembly approved the development of a state-assisted architecture program, establishing the College of Architecture and Planning, which opened on March 23, 1965. The Center for Radio and Television (now named the College of Communication, Information, and Media) opened the following year, in 1966. Recognizing the college's expanding academic curriculum and growing enrollment (10,066 students), the General Assembly approved renaming the school to Ball State University in 1965. Most of the university's largest residence halls were completed during this period of high growth, including DeHority Complex (1960), Noyer Complex (1962), Studebaker Complex (1965), LaFollette Complex (1967), and Johnson Complex (1969). Academic and athletic buildings, including Irving Gymnasium (1962), Emens Auditorium (1964), Cooper Science Complex (1967), Scheumann Stadium (1967), Carmichael Hall (1969), Teachers College Building (1969), Pruis Hall (1972), and Bracken Library (1974), also expanded the university's capacity and educational opportunities. The university experienced another building boom beginning in the 2000s, with the openings of the Art and Journalism Building (2001), Shafer Tower (2001), the Music Instruction Building (2004), the David Letterman Communication and Media Building (2007), Park Hall (2007), Kinghorn Hall (2010), Marilyn K. Glick Center for Glass (2010), and the Student Recreation and Wellness Center (2010). Under the university's 14th president, Dr. Jo Ann Gora, over $520 million was committed to new construction and renovation projects throughout the Ball State campus. Within the last decade, Ball State University adopted Education Redefined as its motto, focusing on "immersive learning" with the goal of engaging students across all academic programs in real-world projects. To date, there have been over 1,250 immersive learning projects, impacting residents in all of Indiana's 92 counties under the mentoring of faculty from every academic department. The university has also adopted environmental sustainability as a primary component to the university's strategic plan and vision. Starting in the mid-2000s, all building additions and renovations are designed to meet Leadership in Energy and Environmental Design (LEED) certification standards. Ball State announced in 2009 that it would begin construction on the largest geothermal energy conversion project in U.S. history. The university was defendant in the U.S. Supreme Court case Vance v. Ball State University, which dealt with who can be regarded as a "supervisor" for the purposes of harassment lawsuits. The case was argued November 26, 2012. In a 5–4 decision, the court ruled in favor of Ball State on June 24, 2013. Ball State University's campus spans 731 acres (296 ha) and includes 109 buildings at 7,203,801 square feet (669,255.0 m2) centered mostly on two main quadrangles. (The university also has just over 400 additional acres of research property.) The original quadrangle, "Old Quad," anchors the south end of campus and includes most of the university's earliest academic buildings, Christy Woods, and the Wheeler-Thanhauser Orchid Collection and Species Bank. The focal points of the Old Quad are Beneficence and the Fine Arts Building, home to the David Owsley Museum of Art since 1935. The museum contains some 11,000 works valued at more than $40 million. The museum expanded its total exhibition space in 2013 from 17,846-to-26,514-square-foot (1,657.9 to 2,463.2 m2). The Fine Arts Terrace, overlooking the Old Quad, hosts the annual spring commencement ceremonies. The newer quadrangle is located to the north and consists of a variety of modern buildings (1960–present), with such landmarks as Bracken Library, Emens Auditorium, and the Frog Baby Fountain, located on University Green. Shafer Tower is the focal point of the new quadrangle. Located in the median of McKinley Avenue, Shafer Tower is a 150-foot-tall (46 m) free-standing bell tower with a 48-bell carillon. McKinley Avenue, which runs north-south through campus, acts as a spine or axis of activity connecting the two main quadrangles. The Scramble Light at the intersection of Riverside and McKinley is a pedestrian scramble that halts vehicular traffic in 30-second sequences, allowing pedestrians to cross the intersection in every direction, including diagonally. A Ball State Cardinals football game at Scheumann Stadium in 2008. Most of Ball State University's athletic facilities and intramural fields are located on the northernmost portion of campus near the intersection of McGalliard Road and Tillotson Avenue. These include First Merchants Ballpark Complex (Ball Diamond and Softball Field), Briner Sports Complex, Fisher Football Training Complex, and the 22,500-seat Scheumann Stadium, home to Ball State Cardinals football. The 11,500-seat John E. Worthen Arena anchors the central campus athletic facilities, including the Field Sports Building, the Health and Physical Activity Building, Lewellen Aquatic Center, and the Jo Ann Gora Student Recreation and Wellness Center. Other facilities include the Cardinal Creek Tennis Center and Lucina Tennis Courts. In January 2018, the Earl Yestingsmeier Golf Practice Facility opened after a year of construction. The 6400 square foot facility features a state of the art 20' x 20' digital simulator. York Prairie Creek, also known as Cardinal Creek, begins at the pond outside Park Hall on campus, winding northwest connecting to the Duck Pond before heading west toward the White River. The university's campus includes nearly 8,000 trees of about 625 species. The university provides a free shuttle service during the fall and spring semesters. Shuttles run on red, green, and blue loops every five to ten minutes, Monday through Thursday, from 7:15 am to 11:00 pm (7:15 am to 8:00 pm on Fridays), and every ten to 15 minutes on Sundays from 5:00 pm to 11:00 pm. Muncie Indiana Transit System (MITS) also provides free bus service to students on local routes, particularly on Routes 1, 2, 14, and 16 which run through campus. The Music Instruction Building at night, with Stephen Knapp's First Symphony in view. Most campus facilities feature red or brown brick façades with the exceptions of Elliott and Pruis Halls, each made of Indiana limestone. Completed in 1899 as the university's first building, the Frank A. Bracken Administration Building was built in Neoclassical style with a yellow brick façade. Most campus facilities built prior to 1960 feature Collegiate Gothic architecture, including Ball Gymnasium, Burris Laboratory School, Fine Arts Building, and L. A. Pittenger Student Center. Other examples include Burkhardt Building, North Quad Building, and Lucina Hall. Several modern campus buildings (early-1960s to early-1980s) have been built in Brutalist architecture, embracing blank walls and exposed concrete. Examples of this style include the Architecture Building, Bracken Library, and Whitinger Business Building. The Teachers College Building, built in 1968, is the tallest building on campus, at 10 floors and 138 feet (42 m). Recent building additions and expansions (early-1990s to present) have shied away from Brutalist designs, and instead, have been built to respect the scale and style of the university's older Collegiate Gothic buildings. While red and brown brick accented by limestone have remained the favored façade materials, large windows have become more commonplace in buildings constructed since the late-1990s to emphasize natural lighting. Examples of this architecture include the Alumni Center, Art and Journalism Building, Music Instruction Building, and the David Letterman Communication and Media Building. Park Hall (shown under construction in 2007) was one of the first LEED certified buildings on campus. Ball State has adopted environmental sustainability as a primary component to the university's strategic plan and vision. Starting in the mid-2000s, all building additions and renovations are designed to meet Leadership in Energy and Environmental Design (LEED) certification standards. Standards include environmentally-friendly site selection, energy and water efficiency, materials selection, and indoor environmental quality, among others. The university diverts 20 percent of its waste from landfills through recycling efforts and also invests in hybrid vehicles, hybrid-electric shuttle buses, and vehicles that use E85. At Spring 2009 Commencement, then-president Jo Ann Gora announced Ball State's plan for the largest geothermal energy project of its kind in the United States. Ball State has committed to reducing greenhouse gas emissions by nearly 80,000 tons annually through the installation of a $65 million geothermal heating and cooling system and the closing of all four coal-fired boilers on campus. The move is expected to save the university $2 million in fuel costs annually. The geothermal system will consist of 4,000 boreholes and two energy stations on campus. The system will consist of two underground loops to circulate water for heating and cooling throughout campus. Since 2007, six campus buildings have achieved Leadership in Energy and Environmental Design certification. The Marilyn K. Glick Center for Glass is considered LEED certified. The David Letterman Communication and Media Building, Park Hall, DeHority Hall, Kinghorn Hall, and the Jo Ann Gora Student Recreation and Wellness Center have earned LEED Silver certification. Studebaker East Complex and District Energy Station North have earned LEED Gold certification. Johnson A Residence Hall is anticipated to receive LEED certification when it opens in August 2015. Johnson B Residence Hall, upon reopening in 2017, will be designed to earn LEED certification. The university's first green roof was installed on the North District Energy Station in 2011, while a second smaller green roof was installed on the second floor of the Architecture Building in 2013. Former president Jo Ann Gora was a founding member of the American College and University Presidents Climate Commitment, an initiative taken by several institutions to address climate change and reduce greenhouse gas emissions on their campuses. In 2011, the Sustainable Endowments Institute gave the university a College Sustainability Report Card grade of "C+." Ball State operates two satellite facilities in the state of Indiana: the Fishers Center for Academic and Economic Innovation and the Indianapolis Center. The Fishers Center for Academic and Economic Innovation, located in Fishers, Indiana—approximately 35 miles (56 km) southwest of the main campus—was dedicated in May 2016 at Launch Fishers, a co-working/business incubator. The location offers academic programs, community engagement, and professional development sessions to students, alumni, and organizations. During the spring semester, entrepreneurship student teams are paired with six Launch Fishers companies to develop growth strategies for each company. The Indianapolis Center opened in 2001 in Downtown Indianapolis as a resource to connect alumni, prospective students, students, and faculty with Indiana communities. Also in downtown Indianapolis, the CAP:INDY Connector opened in August 2016 as an urban laboratory for the College of Architecture and Planning's Master of Urban Design (MUD) program. CAP:INDY Connector offers space for interdisciplinary collaboration between graduate students in architecture, landscape architecture, urban planning, and historic preservation. In 2013, the university announced plans to open an office in Fort Wayne, Indiana, approximately 60 miles (97 km) to the north, to serve with technical assistance, research, and student immersive learning projects. Ball State University enrolls approximately 22,000 students who come from throughout Indiana, the United States, and around the world. Out-of-state students make up about 20 percent of enrollment, and ethnic minorities comprise about 16 percent. The university enrolls more than 500 international students. As of the 2016–2017 school year, Ball State University's student population primarily consisted of Indiana residents (79.8 percent) with 20.2 percent being nonresidents. 59.5 percent of the student body is female. The university is selective, admitting 60 percent of applicants. For the 2016–2017 academic year, annual undergraduate tuition is $7,698 for in-state students and $23,472 for out-of-state students. Including technology, recreation, Health Center, and room and board fees, annual undergraduate expenses total about $18,884 for in-state students and $34,618 for out-of-state students. For the 2016–2017 academic year, annual graduate tuition is $7,092 for in-state students, and $19,404 for out-of-state students. Including other fees, in-state graduate student expenses total $18,238 and $30,550 for out-of-state graduate students. Ball State University offers seven associate degrees, 178 bachelor's, 99 master's, two specialist degrees, and 17 doctoral degrees through eight academic colleges. In 2012–2013, the average campus class size was 32 students, with a student-to-teacher ratio of 16 to 1. Ball State University has been accredited by The Higher Learning Commission continuously since 1925. Bracken Library, the central campus library, was completed in 1975. Bracken Library is the university's main library. Completed in 1975, Bracken houses five floors of classrooms, computer labs, private study suites, and video viewing suites. The library provides access to about 2.3 million books, periodicals, microforms, audiovisual materials, software, government publication maps, musical scores, archival records, and other information sources. Bracken Library hosts the Ball State University Digital Media Repository, an open access resource containing over 130,000 digital objects in 64 collections, as well as the Center for Middletown Studies. System branches include the Architecture Library and the Science–Health Science Library. Over 1.1 million visits were made throughout the University Libraries system between 2011 and 2012. Intel Corporation ranked Ball State as the "most unwired" campus in the nation in 2005. The university's academic and administrative buildings, residence halls, and green spaces have wireless access fed by 625 Wi-Fi access points. The university was ranked eighth by U.S. News & World Report's "up-and-coming" colleges and universities in 2011. Architect magazine ranked the university's Department of Architecture in the top three nationally for digital design and fabrication and one of six schools committed to social justice in the United States in 2010. In 2007, Planetizen ranked the urban planning and historic preservation programs 17th and seventh in the nation, respectively. U.S. News & World Report has ranked the Miller College of Business' entrepreneurial management program in the top 15 in the nation since 1999. Ball State University students and faculty have earned 43 Emmys and 126 Regional Emmy nominations. The Teachers College graduate program was ranked 81st in the nation by U.S. News & World Report in 2013. The Indiana Academy for Science, Mathematics, and Humanities and Burris Laboratory School have been included in Newsweek 's "Best High Schools" as recently as 2013. Completed in 2010, Kinghorn Hall is the third newest residence hall on campus. Ball State University operates 34 residence halls, 30 of which are located within seven complexes, housing 7,550 students. Anthony and Schiedler Apartments on-campus accommodate upper-level single students, students with families, and university faculty and staff. Prices vary for on-campus living with meal plan access to dining facilities. LaFollette Complex had previously contained about 1,900 students, the highest capacity residence hall on campus., but was reduced by 2/5 in 2017 by complete demolition of the Northwest tower that housed Woody and Shales Halls, and half demolition of the Northeast tower that housed Knotts and Edwards Halls. The remaining East to West eight story wing of the Northeast tower was repurposed as office spaces, storage, and work areas for maintenance staff. All residence halls are coed. The Pride of Mid-America Marching Band, one of the largest student organizations on campus. Sixty-two percent of undergraduates are involved in at least one of the more than 400 student organizations at Ball State. These include numerous student government, departmental and professional, special interest, and service groups, all sanctioned by the Office of Student Life in L. A. Pittenger Student Center. There are 38 athletic and recreational clubs, 26 religious groups, and 14 performing arts organizations, including the 200-member Pride of Mid-America Marching Band and University Singers glee club. Multicultural organizations include the Asian American Student Association, Black Student Association, Latino Student Union, and Spectrum, for LGBTQ students, among 12 others. Ball State is often credited as one of the first universities in the nation to begin a Safe Zone training program, which began in 1992, to educate the public and empower LGBTQ allies and advocates. Other notable groups include the Residence Hall Association, Student Government Association, and Student Voluntary Services. As of January 2017[update], Ball State University is home to 34 Greek letter organizations on campus. Membership has increased to 2,474, or 16.17% percent of all university undergraduate students participating in fraternities or sororities. The Ball State Daily News is a student newspaper with a daily circulation of 8,000 copies in the fall and spring semesters, publishing on Mondays, Wednesdays, and Thursdays during the summer semester. Ball Bearings is a student magazine published four times throughout the school year. WWHI, branded as WCRD, is a non-commercial radio station operated full-time by Ball State students from studios in the David Letterman Communication and Media Building. WIPB, East Central Indiana's Public Broadcasting Service (PBS) member station, broadcasts from the Ball Communication Building. The university is also home to WBSU-TV, a public-access cable television station which airs NewsLink Indiana. The Emmy Award-winning NewsLink Indiana is a student-produced news broadcasting operation that airs live on weekday evenings during the school year. Since 1976, the Department of Journalism has supported Cardinal Communications, a full-service, student-run public relations and advertising firm. Ball State competes in the NCAA Division I (FBS) and is part of the Mid-American Conference (MAC) in all sports except for men's volleyball, where it competes in the Midwestern Intercollegiate Volleyball Association (MIVA). Mark Sandy was named Director of Intercollegiate Athletics in January 2015 after 10 years in the Eastern Kentucky University athletic department. Ball State Cardinals football was established in the 1924 season and has a 431–384–32 record as of February 2014[update]. Ball State has won 10 conference championships in football, most recently in 1996, and has appeared in six NCAA Division I postseason bowl games, most recently in 2014 playing Arkansas State University in the GoDaddy Bowl; the Cardinals have an 0–7 record for bowl game appearances. Ball State annually competes against conference rival Northern Illinois, playing for the Bronze Stalk Trophy; Ball State holds a 1–5 record in the contest. Mike Neu is the current head coach, a position he has held since 2016. Ball State Cardinals men's basketball began in 1920. Although there was little success in the program from its start until the 1970s, the next two decades would be the highlight of the program's performance. Ball State became a powerhouse in the Mid-American Conference, winning a record seven MAC tournaments and with subsequent appearances in the NCAA Division I Men's Basketball Tournament between 1981 and 2000. The Cardinals' most successful year was 1990, when the team reached the Sweet Sixteen but lost to eventual national champion UNLV, 69-67. Even though the Cardinals lost the game, BSU player Chandler Thompson recorded what is considered to be one of the most memorable put-back dunks in College Basketball History. The team's last NCAA Division I Men's Basketball Tournament appearance was in 2000. James Whitford became head coach in 2013. Charlie Cardinal is Ball State's mascot, modeled after Indiana's state bird, the northern cardinal. Frog Baby unadorned (left) and dressed in anticipation of winter weather in 2013 (right). The Frog Baby statue has been the center of legend and tradition since it was presented by Frank Ball in 1937. While initially on display in the David Owsley Museum of Art, students began a tradition of rubbing the statue's nose for good luck before taking exams. Over the years, the nose was worn away, and in 1993, the statue was sent overseas for refurbishment. Today, Frog Baby is situated in a fountain on University Green. Since its move and restoration, students have started a new tradition of dressing the statue to reflect weather patterns (scarves and hats in the winter) or current university events (jerseys and helmets for upcoming football games). Despite 24/7 surveillance, the statue has been a repeated target of vandals. Beginning in 1926, Homecoming has brought several traditions. Homecoming Parade was first held in 1939. The parade route begins at Muncie Central High School downtown, travels west down University Avenue through The Village, and ends at McKinley and Neely avenues on campus. The 75th anniversary of the parade in 2012 saw over 100 float entries. Since the inaugural event in 1980, the Homecoming Bed Race has been held the Friday before homecoming. The annual event consists of five person teams within seven divisions, racing beds down a 100-yard course on Riverside Avenue in zany costumes. In 2012, 40 teams participated in the Bed Race. Other Homecoming traditions include Air Jam and Talent Search. Starting in 2004, Ball State students adopted "The Chirp" as a school chant to cheer on teams during sporting events. Traditionally, The Chirp chant begins on the opposing team's third down during Ball State Cardinals football games. Accompanying the chant, participants usually place their index finger and thumb together, extending the other three fingers straight up, and moving their arm in an up and down motion. For at least a decade it had become tradition for students and visitors to stick pieces of chewed gum to a honey locust tree located between Emens Parking Garage and Pruis Hall. The trunk of the "Gum Tree," as it had been named, was covered in colorful wads of used gum. The tree was removed in 2017 by the university in preparation for construction of the East Mall. Responding to a friend's bet, former student Aaron Scheibelhut began the tradition of "Happy Friday Guy" in 2004. Donning a superhero costume, Happy Friday Guy is an anonymous student who rides a scooter around campus shouting "Happy Friday!" among other positive reinforcements to passersby every Friday. Since the character's creation, three students have served as Happy Friday Guy. Ball State University includes more than 178,000 living alumni. 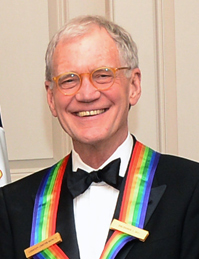 [A] A few of Ball State's most distinguished graduates include David Letterman (BA, 1969), former host of the Late Show, Angela Ahrendts, former CEO of Burberry and current Apple Inc. executive (BA, 1981; DHL, 2010), Prof Dan Kgwadi, Vice-Chancellor North-West University, Potchefstroom, South Africa, Jim Davis, creator of the Garfield comic strip (BA, 1967; LittD (h.c.), 1991), actor Doug Jones (BA, 1982), actress Joyce DeWitt (BA, 1972), Kent C. Nelson, former president and CEO of UPS (BA, 1959; LLD, 1994), Jeffrey D. Feltman, United Nations Under-Secretary-General for Political Affairs, former U.S. Ambassador to Lebanon (BS, 1981), Brent McMillan, National Political Director of the Green Party (BS and BArch, 1991), and Angelin Chang, Grammy Award-winning classical pianist (BA and BM, 1990). A. ^ This information was provided in a document distributed with diploma holders at Spring 2015 Commencement. ^ "Ball State University unveils new brand". Cms.bsu.edu. Retrieved August 7, 2018. ^ "Ball State enrollment largest in university's history". Cms.bsu.edu. Retrieved August 7, 2018. ^ "Brand Colors | Ball State University". Retrieved January 24, 2018. ^ "Carnegie Classifications | Institution Lookup". Carnegieclassifications.iu.edu. Retrieved October 31, 2016. ^ "Large freshman class boosts total Ball State enrollment to 21,998". Cms.bsu.edu. Retrieved October 31, 2016. ^ "Majors and Academics - Ball State University". Cms.bsu.edu. Retrieved October 31, 2016. ^ "The Graduate School - Ball State University". Cms.bsu.edu. Retrieved October 31, 2016. ^ a b "University President Leadership Profile" (PDF). Ball State University. Retrieved July 9, 2016. ^ a b "Fraternity Profiles". Ball State University. Retrieved May 5, 2014. ^ Anthony O. Edmonds and E. Bruce Geelhoed, Ball State University: An Interpretive History (Bloomington, IN: Indiana University Press, 2001), p.51. ^ Perspective (Ball State University alumni magazine), January 2005. Retrieved September 9, 2007. ^ a b "Indiana State University History and Traditions". Indiana State University. Archived from the original on November 29, 2005. Retrieved January 28, 2006. ^ a b White, Glenn (1967). The Ball State Story: From Normal Institute to University. Muncie Indiana: Ball State University. p. 86. ^ a b Edmonds and Geelhoed (2001). Ball State University: an Interpretive History. Bloomington Indiana: Indiana University Press. pp. 126–131. ^ a b c "Office of the President: Biography". Ball State University. Retrieved March 13, 2014. ^ a b "UniSustainStatement". Ball State University. Retrieved October 10, 2013. ^ a b "Leadership in Energy and Environmental Design (LEED)". Ball State University. Retrieved October 10, 2013. ^ a b "Sen. Lugar leads off country's largest geothermal energy project". Ball State Newscenter. Archived from the original on April 2, 2012. Retrieved July 18, 2011. ^ Vance v. Ball State University , 570 U.S. (U.S. 2013-06-24). ^ "Campus Facilities". Ball State University. ^ "David Owsley Museum of Art". City of Muncie, Indiana. Archived from the original on May 10, 2012. Retrieved July 23, 2013. ^ "Museum Renovation". Ball State University. ^ "Arts Terrace". Ball State University. ^ "Shafer Tower". Ball State University. Retrieved May 6, 2014. ^ "Scramble Light". Ball State University. Retrieved May 6, 2014. ^ "Tree Nursery". Ball State University. ^ "Shuttle Bus Service". Ball State University. ^ a b "Administration Building". Ball State University. Archived from the original on May 30, 2013. Retrieved July 23, 2013. ^ "2008 Green College Report" (PDF). Kiwi Magazine. Archived from the original (PDF) on October 5, 2011. Retrieved July 18, 2011. ^ "Green Campus". Ball State University. Archived from the original on July 6, 2011. Retrieved July 18, 2011. ^ Joshi, Monika (April 20, 2012). "Green schools that go beyond basics". USA Today. Retrieved July 22, 2013. ^ "Going Geothermal FAQ". Ball State University. Retrieved July 18, 2011. ^ "Our Commitment to the Environment". Ball State University. Retrieved October 10, 2013. ^ "Greening the campus from the top down". Ball State University. Retrieved October 10, 2013. ^ "Mission and History". ACUPCC. Archived from the original on July 18, 2011. Retrieved July 18, 2011. ^ "College Sustainability Report Card 2011". Sustainable Endowments Institute. Retrieved July 18, 2011. ^ "Fishers Center for Academic and Economic Innovation". Ball State University. Retrieved August 15, 2017. ^ "Ball State Indianapolis Center". Ball State University. Retrieved August 15, 2017. ^ "CAP:INDY Connector". Ball State University. Retrieved August 15, 2017. ^ Slabaugh, Seth (October 6, 2013). "BSU to open office in Fort Wayne". The Star Press. Archived from the original on October 11, 2013. Retrieved October 10, 2013. ^ "Overview of Race and Hispanic Origin: 2010" (PDF). 2010 American Community Survey. United States Census Bureau. Retrieved May 5, 2014. ^ a b "2016-17 Ball State Fact Book--Student Ethnicity" (PDF). Retrieved January 24, 2018. ^ a b "2016-17 Ball State Fact Book--Student Residency" (PDF). Retrieved January 24, 2018. ^ "2016-17 Ball State Fact Book--International Students" (PDF). Retrieved January 24, 2018. ^ "2016-17 Ball State Fact Book--Students' Gender" (PDF). Ball State University. Retrieved October 31, 2016. ^ "2015-16 Ball State Fact Book--Freshmen" (PDF). Retrieved January 24, 2018. ^ a b "Tuition and Fees". Ball State University. Retrieved October 31, 2016. ^ "Fact Book: Academic Programs". Ball State University. Retrieved March 13, 2014. ^ "Ball State University". The Higher Learning Commission. Retrieved December 3, 2006. ^ "Special Programs". Ball State University. Retrieved March 13, 2014. ^ "University Libraries' Performance Summary against Goals: 2011-2012" (PDF). Ball State University. ^ "Ball State University Moves To Head Of The Class In Intel's Ranking Of The Top 50 "Most Unwired" U.S. Campuses". Intel Corporation. Archived from the original on June 26, 2006. Retrieved December 3, 2006. ^ "National Recognition". Ball State University. Retrieved July 23, 2013. ^ "College of Architecture and Planning students win national competition". Ball State University. Retrieved July 23, 2013. ^ "Awards and Achievements". Ball State University. Retrieved July 23, 2013. ^ "Miller College of Business". Ball State University. Retrieved July 23, 2013. ^ "College of Communication, Information, and Media – Telecommunications". Ball State University. Retrieved July 23, 2013. ^ "Teachers College". Ball State University. Retrieved July 23, 2013. ^ "Dwelling + Dining". Ball State University. Retrieved July 22, 2013. ^ "University Apartments". Ball State University. Retrieved May 5, 2014. ^ "LaFollette Residence Hall Complex". Ball State University. Retrieved May 5, 2014. ^ "The Nunnery". Ball State University. Retrieved May 5, 2014. ^ "Student Organizations". Ball State University. Retrieved May 6, 2014. ^ "Sports and Recreation Groups". Ball State University. Retrieved May 6, 2014. ^ "Religious Organizations". Ball State University. Retrieved May 6, 2014. ^ "Pride of Mid-America Marching Band". Ball State University. Retrieved May 6, 2014. ^ "Performing Arts Organizations". Ball State University. Retrieved May 6, 2014. ^ "Multicultural Organizations". Ball State University. Retrieved May 6, 2014. ^ "History of the Safe Zone Program". Medical University of South Carolina. Retrieved May 5, 2014. ^ "Safe Zone". University of Illinois at Chicago. Retrieved May 5, 2014. ^ "LGBT Resource Center". University of Houston. Archived from the original on May 6, 2014. Retrieved May 5, 2014. ^ Berg, Kara (March 17, 2014). "New fraternity joins growing Greek Life". The Ball State Daily News. Retrieved March 18, 2014. ^ "Sorority Profiles". Ball State University. Retrieved May 5, 2014. ^ "The Ball State Daily News". Ball State University. Retrieved July 23, 2013. ^ "Ball Bearings". Ball State University. Retrieved July 23, 2013. ^ "About". WCRD. Retrieved May 6, 2014. ^ "News Student Organizations". Ball State University Department of Telecommunications. Retrieved May 6, 2014. ^ "Cardinal Communications". Ball State University Department of Journalism. Retrieved July 23, 2013. ^ "Ball State University Profile". NCAA. Archived from the original on January 6, 2007. Retrieved January 2, 2007. ^ "Mark Sandy Bio - The Official Site of the Ball State Cardinals". Archived from the original on September 5, 2015. Retrieved February 7, 2016. ^ "Frog Baby". Ball State University. Retrieved May 5, 2014. ^ Abernathy, April (August 16, 2008). "Myths and legends haunt BSU". The Ball State Daily News. Retrieved May 5, 2014. ^ Mishler, Andrew (February 28, 2013). "Frog Baby to cost more than $3,000 to repair". The Ball State Daily News. Retrieved May 6, 2014. ^ a b c d "Bed Race". Ball State University Alumni Association. Retrieved May 6, 2014. ^ Harcourt, Constance (October 11, 2012). "Ball State marks 75 years of tradition at Homecoming parade". The Ball State Daily News. Retrieved May 6, 2014. ^ Ortiz, Anna (October 11, 2012). "Friday's Homecoming Bed Race introduced new division". The Ball State Daily News. Retrieved May 5, 2014. ^ Slabaugh, Seth (September 7, 2013). "Ball State's treasured "gum tree" in no danger". Associated Press. Retrieved May 6, 2014. ^ Fittes, Emma Kate (May 14, 2017). "Why Ball State chopped down 'gum tree'". USA Today. Retrieved August 15, 2017. ^ Grady, Danielle (March 2, 2014). "Happy Friday Guy spreads joy throughout campus". The Ball State Daily News. Retrieved May 6, 2014. Wikimedia Commons has media related to Ball State University.